Why should I join the Columbus Saints? Being a member of the Saints is like being part of a large family, that’s supportive, friendly, and challenges you as a performer. Our program is perfect for students who want to gain skills to help them in college, DCI or WGI ; college students who are seeking a competitive band experience; or age-outs & working adults who just love to march and want to grow their family of friends! We compete in Drum Corps Associates allowing us to provide a competitive, affordable, weekend only, all-age drum corps experience. When and where are audition and rehearsal camps? Our audition and rehearsal camps are held at local schools, churches, and facilities across Ohio. They are generally a one-day instructional camp, where new members are evaluated and the corps begins to set its lines for the season. Regular rehearsal camps are on weekends throughout the winter and spring, usually two weekends per month. Prospective members should expect most every weekend from June through August to have a required event. Camps are almost always scheduled from 9am-6pm Saturdays and 9am-6pm Sundays. What is the rehearsal and performance schedule like? The Saints are primarily a “weekends-only” activity with rehearsals, and events that are each very important to the organization. From mid-June until Labor Day weekend most every weekend is filled with rehearsal, travel and or competitions with at least one mid-season scheduled weeklong vacation block for family and friends to enjoy some off time. At least two of our trips require we leave on Thursday night for travel. It’s a large time commitment but the rewards are great as you make friends and memories that will last a life time! What if I have a school conflict during camps or summer performances? Members are expected to attend all required rehearsal camps for their section. In the event of a conflict, members are expected to make an effort to attend at least part of the camp when possible. We realize school-related performances and academically required events are priorities; however, absence from all or part of a camp must be approved by the director and your caption head no later than one week prior to camp. How much does it cost to participate in the Columbus Saints ? 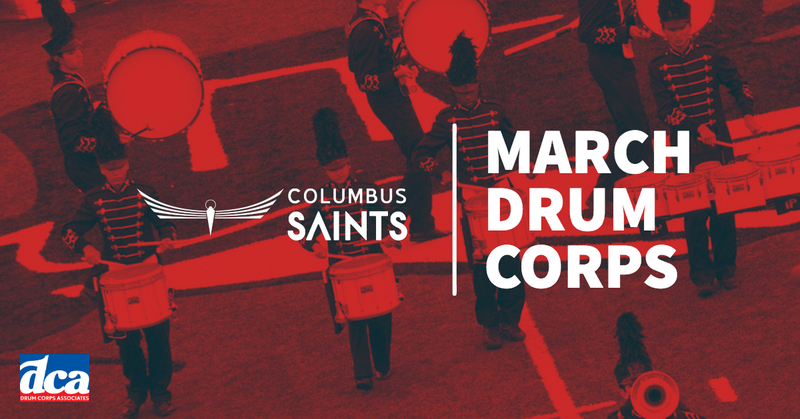 Running a drum & bugle corps is an expensive proposition but the Saints work hard to keep costs low for everyone. When you take a detailed look at the value of education, travel, lodging, food, and more for nearly 8-9 months – it’s an incredible value (and a fraction of the cost of other summer educational programs). All members are asked to pay a flat membership fee which covers tour, education, uniform, and associated costs, and also earn (or pay for) required fundraising credits. 2019’s Fees and Costs are still being finalized, but the complete financial cost will be outlined in detailed during Auditions. Discounts may apply to certain members, but as a general guideline a full season of the Saints costs most members between $800-$1100. What do the fees and tuition associated with membership cover? Audition costs including Membership packets, application processing, online member account setup, t-shirt, facilities, and music. This fee is non-refundable. What are some miscellaneous costs assumed by members that I might incur? When are payments due and what payment options are available? All fees required to be paid by certain deadlines during the winter season and on those dates are due at or before you arrive for camp. We accept credit card transactions through our website or cash/checks through the mail or at camps. Members may elect to pay their tuition in one of two ways: 1) Full Payment – pay the total tuition amount by a specified date and receive a discount; 2) Payment Plan – pay equal amounts on a regular schedule to be completed before the tuition deadline. There are a limited number of scholarships to help members offset their tuition. Scholarships are awarded by the Executive Director and multiple factors are considered in awarding them – including attendance, need, personal fundraising efforts and other factors. We do advise you not count on these funds to help cover regular tuition payments. What do I wear for rehearsals? The Saints required rehearsal attire is BLACK athletic shorts, and a plain BLACK (or DARK COLORED) t-shirt. We usually consider our final block a performance and at times will video record or live stream and want to represent the corps in an organized and uniform manner! How are housing and meals accommodated at camps? For 2019, the Saints currently, will not offer lodging for rehearsal weekends. We will however assist members in obtaining hotel discounts, or meeting At most camps, we will not provide food for members. While on tour, we usually provide breakfast, lunch, and occasionally dinner or snack. At many competitions we won’t provide dinner giving members an option to purchase concessions/restaurant/local food. What do I need to bring to weekend camps? Comfortable, exercise-friendly clothes and athletic shoes for rehearsal. What happened to the Saints Drumline Inc? Marshall Cheatham; Executive Director and founder of The Saints Drumline Inc., grew up in urban Chicago during the 1960s and 1970s. One of the most formative experiences for him was marching for nearly a decade as a member of the St. Andrew’s Hornets’ Drum & Bugle Corps continuing the tradition of African-American Drum & Bugle Corps. In 2012 he desired to provide a broader entertainment and educational experience to the greater Columbus community and transitioned to the Saints Performing Arts. The Saints Drumline is part of the organization but is one of the many ensembles under the Drum & Bugle Corps.